It is not my intention to tell the story of the attack, or the leadup to it, or the aftermath. If you don’t already know the story there are loads of places you can find out – starting here with Wikipedia – and more than likely your local history channel will air a documentary about the attack at some point today.. I could not do justice to the story of what happened, nor could I do justice to my own personal feelings about Pearl Harbor. I cannot tell you the story of my meeting survivors of the attack during our visit to Oahu in 2011. 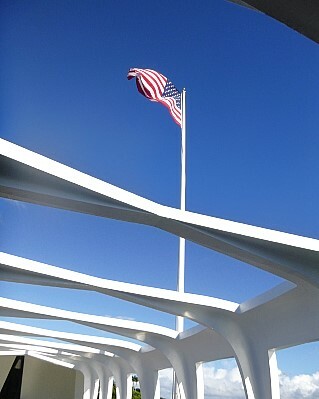 I will simply state that Pearl Harbor is an incredibly special place for so many reasons – and so is Hawaii overall. 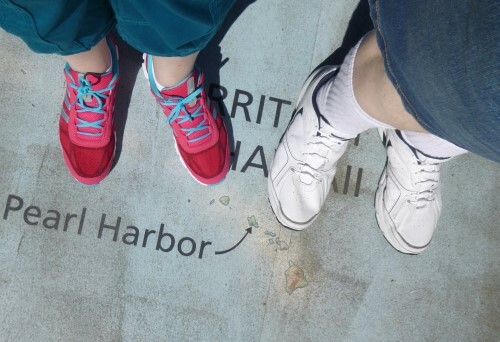 What I *will* talk about today is the shoes I wore to visit Pearl Harbor, and a special map moment that happened while Sephyroth, The Other Half, and I were at Pearl Harbor in November 2013. These Adidas Climacool shoes were the first pair I bought last trip and the photo above is me trying them on in the store. I got them at Ala Moana on Friday the 1st of November. You may recall, I also own Adidas Climacool in green. 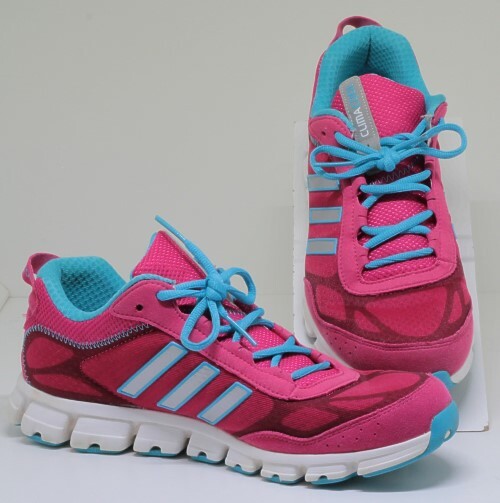 The green and pink Climacool shoes saw a lot of wear while on Oahu because they are super perfect for a hot environment – most of the other shoes remained unworn until they arrived back home. At Pearl Harbor there is a large map drawn on the ground near the entrance. You can see in the image above my feet standing near Sydney. At the same time, the feet of Sephyroth were standing around abouts where he hails from in North America. Very nice shoes!! I like them a lot. 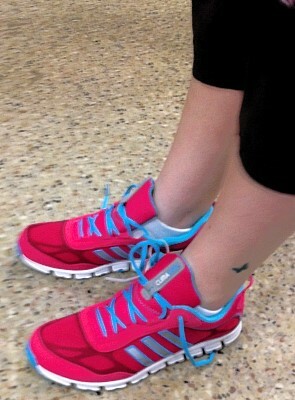 I can’t buy Adidas, they don’t come wide enough for my short feet.